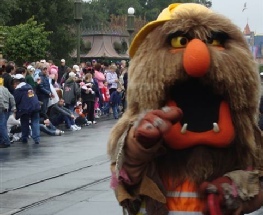 Rumor has it that there are DizFanatic family members acting as covert operatives within the walls of the Disney labyrinth. These operatives aim to reveal the deepest, closely guarded secrets unknown to the outsider until now. Well, that introduction is definitely over the top, but it does sound exciting. What the DizFanatic insider really is all about is that several fellow DizFanatics around the globe will be on-site to bring you the latest updates on new events, soft openings, construction and other surprises as they happen. We hope this will help to feed your hungry belly of even more exciting Disney information. Our appetite is constantly growing and we love to share the feast with you! Stay tuned as this section will soon be filled with goodies! Here's some great construction photos of Disney's Aulani Resort! showing off how much progress they’ve made. Just 6 months away from phase 1 opening!. Thanks Joel! Here are some new construction photos of Disney's Aulani Resort along with some nice shots of the new on-site model room. This is shaping up to be an amazing resort. Thanks Donna! 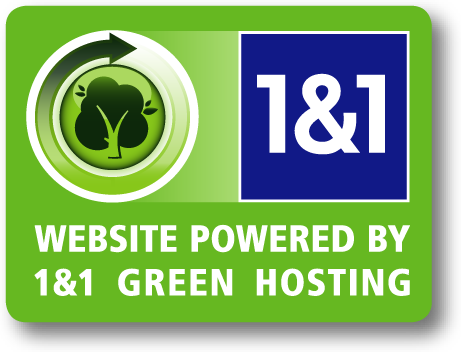 Our friend Mike, from TimeStream Software, just paid a visit to Hawaii. He reports that Disney representatives are on the beach in front of the Aulani construction site answering passer by's questions about the magnificent new structure. Here are some new construction photos of Disney's Aulani Resort that he submitted. Thanks Mike! Captain Jack Sparrow's Black Pearl is now afloat off the waters of Hawaii! And here are some new construction photos of Disney's Aulani Resort! Our local Hawaii insider has posted a new photo update on the renovation progress of Jack Sparrow's Black Pearl. Check out her photos of the Black Pearl here to see the progress. Thanks Donna! Our local Hawaii insider has captured Captain Jack Sparrow's world famous Black Pearl undergoing a renovation in preparation for the 4th installment of box office smash hit "Pirates of the Caribbean." Check out her photos of the Black Pearl here to see the progress in a shipyard in Kapolei, Hawaii. Another big thanks to Donna! Our local Hawaii insider swung by the site of Disney's new Aulani Resort, no in construction in Ko Olina Hawaii, and took some great construction photos! You can see those photos on our Aulani Information page. Thanks Donna! 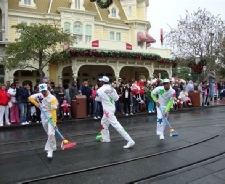 Today, Magic Kingdom’s Celebrate a Dream Come True parade was preceded by a new and exciting pre-parade, that will accompany the 3 o’clock parade throughout the new year. 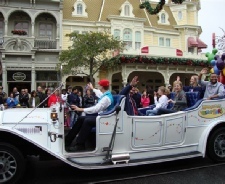 As many people know, this year the Disney parks are promoting the “Give a Day, Get a Disney Day” give away. 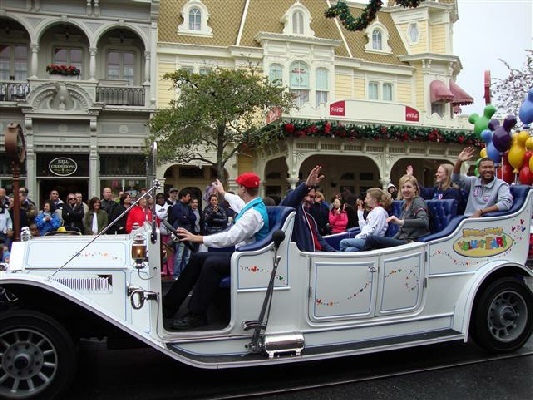 For one day of work, volunteers, or voluntEARS, will receive a free ticket to one of the Walt Disney World parks, or Disneyland park. 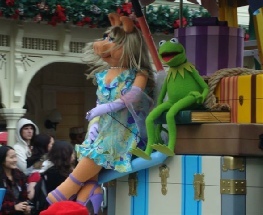 The pre-parade was announced as the “most sensational, inspirational, celebrational, muppetational pre-parade”. And that is exactly what it is. Although the pre-parade, the “Honorary VoluntEARS Cavalcade”, is a short nod to the volunteers that are donating their time to doing some good in their communities this year, it definitely packs a punch. 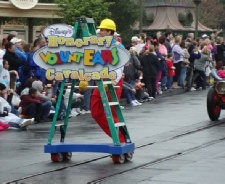 Parade Grand Marshalls are “Honorary VoluntEARS” and ride in cars alongside, painters, carpenters, and our very favorite Muppets. 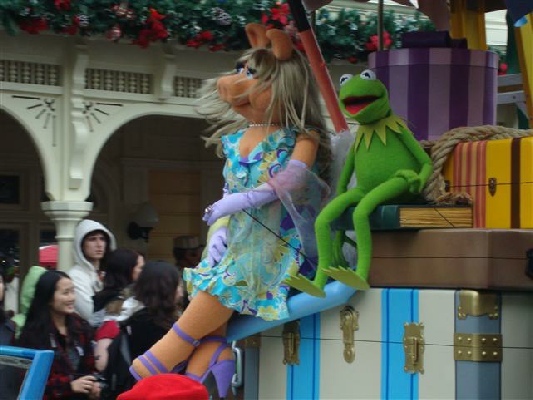 Miss Piggy, Kermit and Sweetums represent the Muppet family who are the spokesMuppets of this year’s “Give a Day, Get a Disney Day” promotion. They ride along to an upbeat “volunteer-y” version of Celebrate You. 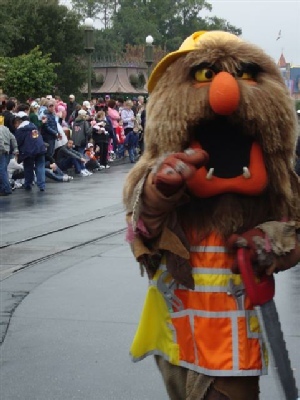 Altogether, the Honorary VoluntEARS Cavalcade is an exciting representation of the work that’s going on around the country this year, and it is definitely worth getting to the 3 o’clock parade a few minutes earlier to catch the Muppet-y excitement.